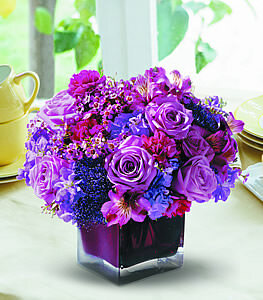 If someone you know loves the color purple, this bouquet of fresh flowers in an array of rich plums, lavender and deep pinks -- gathered together in a plum glass cube -- will create a sensation! Lavender roses, pink waxflower, purple stock and alstroemeria, fuchsia miniature carnations and trachelium are delivered in a plum cube. Note: not available in all areas; a clear cube may be substituted if the plum cube is unavailable.